ERack is a lightweight, 19-inch ruggedised aluminium electronic transit rack, specifically designed for demanding commercial and military applications in all weather conditions. CP Cases, the designer and manufacturer of high-performance protective cases and 19 inch racks, is to showcase the new design aspects of its ERack range of fully customisable products at Eurosatory, Paris between 11-15 June (UK Pavilion Stand 25). All aspects of configuration and customer specific designs can be accommodated. There are 1000’s of ERack all-weather 19″ enclosures in continual use all over the world, in extreme climates, marine environments, corrosive atmospheres, remote, unmanned and isolated locations. Whether used in front line military critical applications in the desert, or offshore oil platforms in the arctic circle, ERacks are designed and built to perfectly suit individual customers engineering requirements. Where weight, strength and portability are critical issues ERack benefits from patented new technology. The external container has an innovative folded rim design, which eliminates the edge extrusion and makes the case stronger, lighter and resistant to ingress by water and dust. The robust internal 19″ chassis frame is supported by special mounts which protect against drop, shock and vibration. ERack is up to 30% lighter than other rack cases in its class. between lids and body is achieved by ERack’s unique patented rimfold which incorporates a silicon gasket seal giving all weather protection to IP65. EMC screening Is accommodated using a braided all-weather gasket, ensuring conductivity throughout the enclosure. ERack’s unique CV2 patented 19-inch chassis design is constructed from CNC machined precision extrusions, delivering enhanced lightness and rigidity. The chassis is mounted on eight (or 16) elastomeric mounts, welded to the outer body by robust anchor plates, which are focused towards the centre of mass of the case, ensuring the electronic equipment is protected against vibration and impact whatever the orientation. Suspended inner chassis can sway up to 50mm independently of the outer container, and in any direction. An earthing / grounding woven braid is fitted to maintain conductivity between the equipment and the outer container. 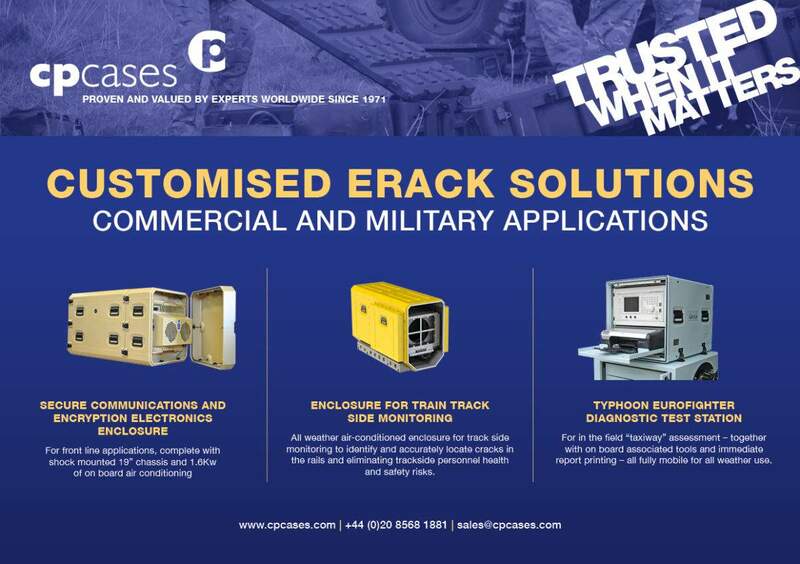 Peter Ross, Managing Director, CP Cases: “Taking our 45 years of experience in the business forward to meet client expectations – the customisation possibilities of ERack provide proven solution to our exacting global customers specifications, in aerospace, defence and commercial applications. We listen carefully to what our customers require get exactly what they want”.